The Snohomish River is a river in the U.S. state of Washington, formed by the confluence of the Skykomish and Snoqualmie rivers near Monroe. It flows northwest entering Port Gardner Bay, part of Puget Sound, between Everett and Marysville. The Pilchuck River is its main tributary and joins the river at Snohomish. 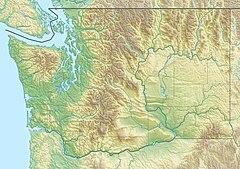 The river system drains the west side of the Cascade Mountains from Snoqualmie Pass to north of Stevens Pass. Debris in the November 2006 flood is swept under the Route 9 Bridge. Measured at Monroe, the Snohomish River has an average annual flow of 9,500 cubic feet per second (270 m3/s). In comparison, the Columbia River, Washington's largest river, has an average flow of about 265,000 cubic feet per second (7,500 m3/s). ^ Kammerer, J.C. (May 1990). "Largest Rivers in the United States". U.S. Geological Survey. Retrieved 2008-04-01. This page was last edited on 26 January 2019, at 04:01 (UTC).